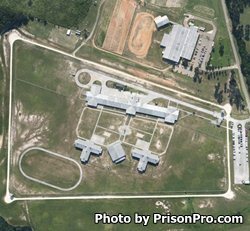 Diboll Correctional Center is a privately run prison located in Angelina County Texas. The facility is operated through a contract with Management Training Corporation (MTC). Diboll Correctional Center is a minimum security prison that houses up to 518 adult males of G1 and G2 custody levels. This facility places a strong emphasis on individual accountability and rehabilitation through programing. Offenders can take carpentry courses, learn computer applications, commercial cleaning, painting, and participate in parenting and anger management classes. Diboll Correctional Center provides adult basic education and GED courses to inmates. Substance abuse treatment, medical, and dental services are available to offenders at Diboll. Additionally, inmates may participate in a variety of religious worship services and bible studies. Once you are on the inmate's approved visitors list you can visit your inmate at Diboll Correctional Center on Saturdays and Sundays from 8am-5pm. Visits are two hours in duration, and visitors may bring up to $20 in quarters in a clear Ziploc bag to purchase items from the vending machines.